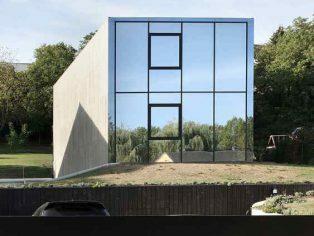 Luxembourg-based architectural practice, 2001, has completed Hercule, a monolithic concrete single-family house in Mondorf-les-bains, in the South of Luxembourg. Named after local hero John “Hercule” Gruen for its robust strength, the volume emerges fiercely from the ground like the tip of an iceberg: the stepping of the plot, a residual portion of land situated between an old farm-house and a suburban villa, drove the design, breathing a strong sense of grounding into the site. Rather than working against the topographical constraint, the natural context helped to determine the layout of the home’s three levels as they step down the slope. The basement gathers all the technical functions, including the garage; the entrance, the wardrobe, the laundry room, the fitness & spa area, the wine-cellar and the kitchen, as well as the dining-room and the living area, both of which are arranged in a single space of 14 x 6m, and open completely on the south-west side via a patio. These dimensions are repeated on the upper two floors, which accommodate the bedrooms and bathrooms. Designed according to an essential aesthetic, they are included in a compact volume that represents the only visible part of the building from street level. In this way, the architects attained maximum privacy and minimized the building’s visual impact over ground. Different approaches define the façades. 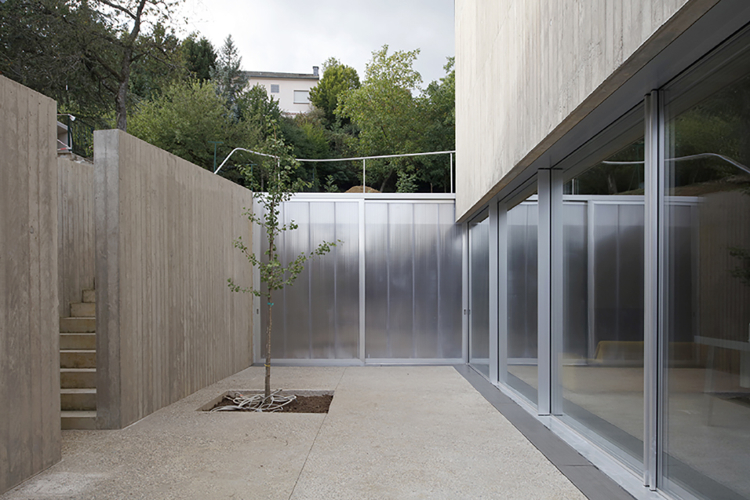 To the south, a blind béton brut wall works as a beam for the upper two floors, in order to prevent the need for a column in the living room, while the north elevation presents punctual openings onto the garden, framing different landscape elements through furniture-windows. The east and west façades, oriented towards the street and the garden, are treated as curtain walls with a solar protective glass. 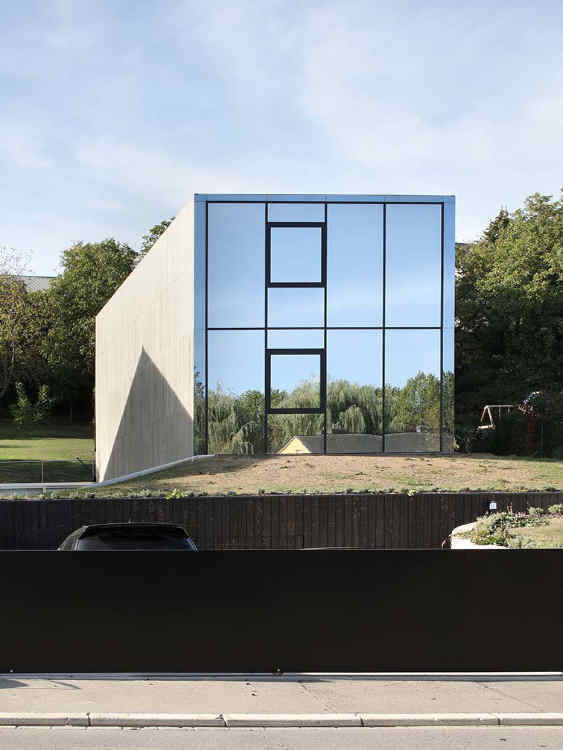 Reflecting both suburban and landscape contexts, the house blends in with its surroundings. Only the main structural elements are visible, and are enhanced through the use of formwork or sanding. 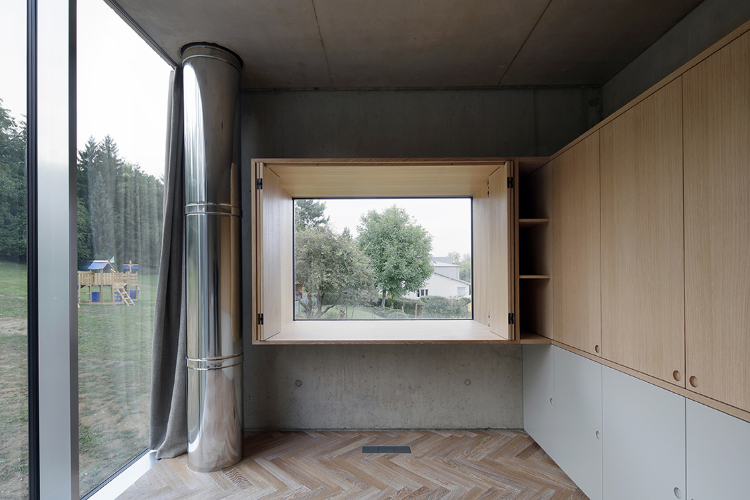 The resulting austerity, which is unusual for contemporary domestic standards, underlines the essence of the project: the minimal quality of the interiors fosters a relationship with the context. The design facilitates the appropriation and the application of timeless architecture by its users in their daily lives.